It may not go anywhere specific, just leading the eye to another part of the garden, or it may just be functional. The medium can be so distinctive that it is a work of art, or it can be unobtrusive, intended to blend and be softened by plant materials. But a path is an integral part of any garden, and can be used to pull the whole design together. A straight, formal path made of 'hardscape' materials such as stone, brick, or concrete leads the eye directly to a focal point--the front door, the garden gate, artwork, or a water feature. Plant materials will generally follow the lines created by the path to further emphasize the visual focus. A curved path, or one that widens in places, will naturally slow down the visitor and draw the eye to points of interest, or around the corner. Plants will spill out over the path to soften it, and groupings of shrubs or trees can be used to frame a special view. A wider spot may have a bench to invite you to linger. Your choice of material makes a big difference in ambience. Lighter colored, harder materials reflect sunlight and increase heat. Dark stone materials, rare in this area, absorb and retain heat. Darker, softer materials will absorb heat and disperse it to the surrounding soil, making more comfortable surfaces and reducing temperatures. 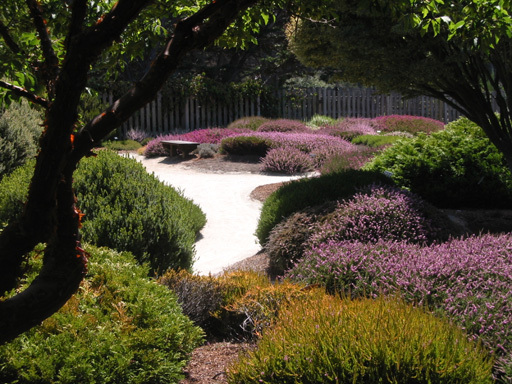 Traditional in rainier climates, turf paths can be a challenge in our hot dry summers. The odd, often narrow shapes are difficult to water, and grass needs water a couple of times a week. Ground covers can be planted around some of the other path materials, giving the impression of a 'lawn'. But there is no ground cover that can take as much regular foot traffic as grass --though Glechoma (ground ivy) and dichondra come close! Heat factor: Grass paths are the most comfortable to look at and walk on, and provide natural air conditioning. ... makes an attractive, simple, functional path, but I have seen so many botched homeowner installations that I strongly recommend hiring a concrete contractor. Traditional gray concrete looks austere. But it can be colorized or stamped to look like stucco or brick, can be curved or shaped, and a path can be widened seamlessly into a patio or sitting area. Heat factor: Light-colored concrete increases glare and heat dramatically. Dark-colored concrete can become uncomfortable to walk on. ...make a formal look. Landscape contractors can install these for you, or you can do some homework for a do-it-yourself project. Soil will need to be excavated to a depth of at least 4" (and hauled somewhere else!). A bed of gravel, then sand, is installed as a base. Headerboard or composite plastic materials frame the material along the edges. The base is tamped firm, then the bricks or stones are set in place and tamped again. More sand is swept in to fill the cracks. Heat factor: These reflect heat and increase the surrounding temperatures. ... is set in any pattern, and the gaps between the irregular-shaped stones are often planted with low ground covers. Though normally set on a base of gravel and sand as with brick or stepstones, very large, thick pieces of flagstone can be purchased and set about half-buried into native soil without a base. They may shift or settle somewhat, but can provide a serviceable path with little effort. Heat factor: Arizona flagstone, the most common, reflects heat, making the surroundings brighter and hotter. Dark colored slate absorbs heat; in fact, it may get very hot to the touch. Note: It is crucial that any path of brick, concrete, stepstones, or flagstone be crowned somewhat to allow water to drain off the surface, and that the natural grade of the yard not be disrupted by the installation! A drain system may be necessary if water is going to be 'trapped' by the new path. ...(DG) looks like clean dirt. It is functional, cheap, simple to install, and drains pretty well. Excavate a couple of inches of soil, put in benderboard or some other edging if you want a clean edge, and dump in the DG. Add it an inch at a time, rake it smooth, roll it, tamp it down, and add another inch. Be sure to crown it slightly above your existing grade to allow for settling. Weeds may grow, and it does track somewhat when it's muddy. For an informal look, excavate the path wider in places and skip the edging. Let the DG spill into nearby beds, and grow some low spreading plants along the edges. Heat factor is intermediate. Light colored when dry, it reflects heat and increases surrounding temperatures. Dark when moist, it absorbs heat. Overall the effect is not as extreme as harder materials. ... can be the simplest way to make a path. Pull or kill the weeds, till and roll the soil if you need to grade it. Landscape fabric can be put down to prevent weeds. Then install 2 - 4 inches of bark. The finer the material, the more comfortable it will be to walk on: look for 'micro' or 'pathway' bark. Or use some of the shredded bark products made from fir, redwood, or cedar. Bark will need to be augmented every couple of years. Heat factor: absorbs heat, which is dispersed into surrounding soil. ...are the least comfortable. Pea gravel is used in institutional settings because it is relatively inexpensive, easy to install, and requires little followup. But weeds will grow in it, it scatters, and gravel paths look nearly as austere as concrete. Gravel hit with a lawn mower becomes a dangerous projectile! Heat factor: though gravel varies in proportion of light rock, most reflect heat to an uncomfortable degree. ...can be planted to soften the look. None will take heavy foot traffic, and the reflection of heat in full sun makes an extreme microclimate that can be difficult for establishing young plants. Fast drainage of the sand and gravel base means careful watering will be necessary. Given the range of sun and shade exposures over the length of a typical path, a mix of different plant materials can be good insurance! Dichondra-- subtropical lawn substitute grown in Southern California; can be planted in shade here. May be damaged in winter, but recovers. Dymondia--a silver-leafed, tight grower with small yellow flowers; prefers to be kept dry. Herniaria repens--a very flat green carpet which grows rather slowly. Prefers regular watering. Sedum anglicum--a low succulent with good drought tolerance. Thymes--various creeping thymes, including woolly, pink, coconut, and elfin, are among the most popular. They tend to thin out after a year or so and may need trimming after bloom. Easy to overwater--keep 'em on the dry side. White clover--dark foliage gives a lawn-like look, but flowers draw bees. Water like a lawn. Somewhat taller plants can be planted along the edges to trail into the path and make a softer look, or provide contrast. Chamomile-- foliage smells sweet when bruised, and the yellow flowers are pretty. Looks shaggy after bloom and should be trimmed. Fescue (blue or gray) grass-- tufts of silver foliage provide a nice contrast to lower growing plants, and a long repeating pattern of these can be an effective way to draw the eye towards a special plant or feature. Sedums -- Taller ones (S. confusum, S. rubrotinctum) have shiny foliage which provide great contrast, and some have pretty yellow or white flowers. All can take sun or some shade, dry conditions or regular watering. Snow-in-summer-- (Cerastium tomentosum) makes a mat-like appearance, but at 2 - 3 inches is a little tall for the main path area. Silver foliage is topped by white flowers in late spring, after which a light shearing or mowing makes a tidier appearance. Sweet alyssum-- white, pink, or purple flowers nearly year-round on this annual which reseeds prolifically. Most of those listed above are sun lovers; other ground covers prefer shade--Baby Tears, Campanula, Viola hederacea. Many other perennials can be used to complement your path. Experiment!